Home > Speakers > Catherine Outerbridge D.V.M. Dr. Outerbridge is a 1990 graduate of the Ontario Veterinary College at the Univesity of Guelph in Ontario, Canada. She completed her masters of veterinary science and a residency in small animal internal medicine at the Western College of Veterinary Medicine at the University of Saskatchewan. 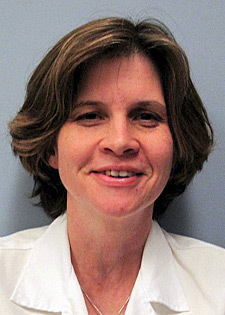 She has been a Diplomate of the American College of Veterinary Internal Medicine in small animal medicine since 1998. Dr. Outerbridge completed a residency in dermatology at the University of California – Davis and has been a Diplomate of the American College of Veterinary Dermatology since 2005. She has held clinical staff positions at the University of Saskatchewan and UC Davis and since 2005 has been an Assistant Professor of Clinical Dermatology at UC Davis, School of Veterinary Medicine. Dr. Outerbridge’s professional interests include all aspects of clinical dermatology, with a particular interest in cutaneous manifestations of systemic disease as well as infectious and metabolic skin diseases.